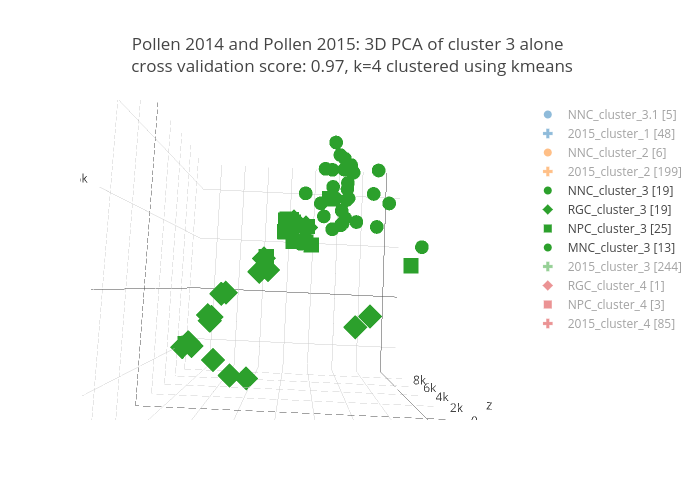 Smplbio's interactive graph and data of "Pollen 2014 and Pollen 2015: 3D PCA of cluster 3 alone cross validation score: 0.97, k=4 clustered using kmeans" is a scatter3d, showing NNC_cluster_3.1 , RGC_cluster_1 , NPC_cluster_1 , MNC_cluster_1 , 2015_cluster_1 , NNC_cluster_2 , RGC_cluster_2 , NPC_cluster_2 , MNC_cluster_2 , 2015_cluster_2 , NNC_cluster_3 , RGC_cluster_3 , NPC_cluster_3 , MNC_cluster_3 , 2015_cluster_3 , NNC_cluster_4 , RGC_cluster_4 , NPC_cluster_4 , MNC_cluster_4 , 2015_cluster_4 ; with component 1 in the x-axis and component 2 in the y-axis.. The x-axis shows values from 0 to 0. The y-axis shows values from 0 to 0.